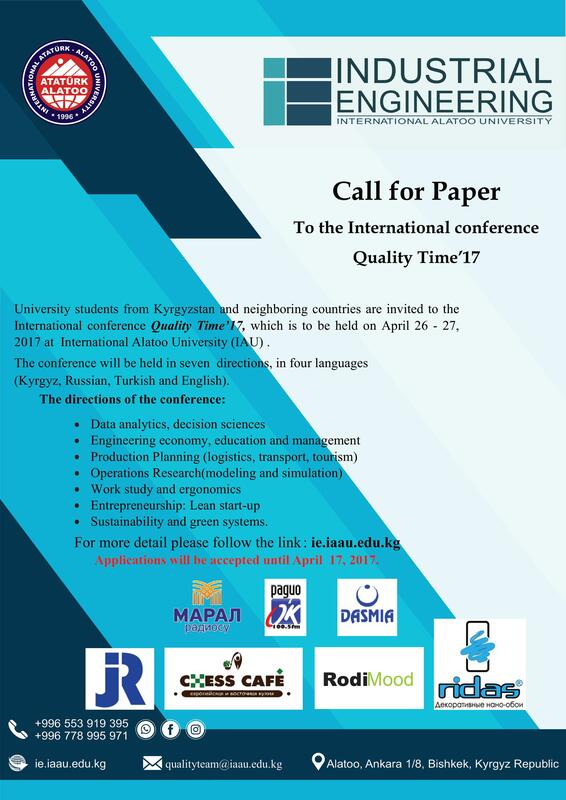 University students from Kyrgyzstan and neighboring countries are invited to the International conference Quality Time’17, which is to be held on April 26 - 27, 2017 at International Atatürk Alatoo University (IAAU) . The purpose of the conference: promotion of the Department of Industrial Engineering, involving students of universities from Kyrgyzstan and neighboring countries to exchange knowledge and acquire the skills of public speeches. Students can write an article, project, or show exhibition, etc. • Sustainability and green systems. Day-1: Competition among IAАU students, identification of medalists 8-12 persons. Day-2: Competition among the medalists from IAАU and other students of Kyrgyzstan and neighboring countries, determination of 3 medalists. - Font: Times New Roman font, 12 pt. - Links to the literature are given in the article in square brackets. The article ends with bibliography. Using illustrations, audio, video materials supported. Articles will be checked on plagiarism. Applications will be accepted until April 17, 2017.